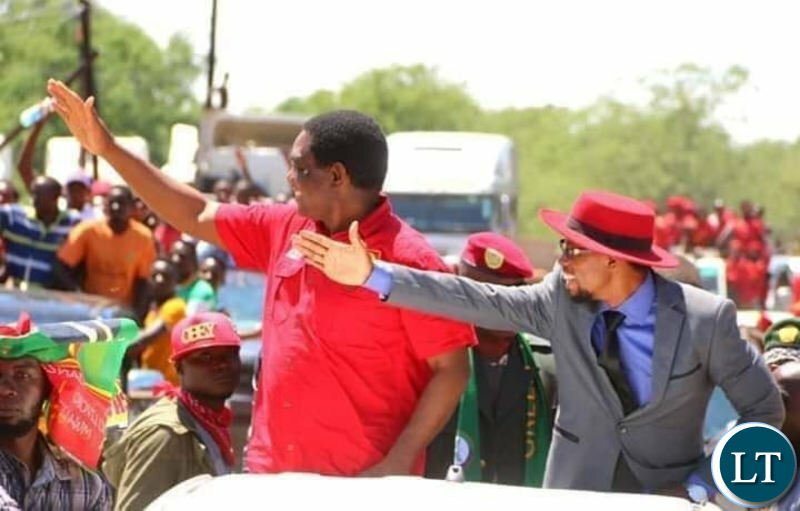 Opposition leader Hakainde Hichilema has thanked voters in Sesheke for voting for the party’s candidate Romeo Kango’mbe in Tuesday’s by election. Mr Hichilema said Zambian youths should use the election of the 35 year old Mr Kango’mbe as moment to recognize the leadership potential they posses. “We thank our members and citizens across the country for standing up against the bullets, machetes, teargas and all sorts of offensive weapons that were being used against them in the just ended bye elections in Sesheke,” Mr Hichilema said. I am starting to slowly warm to him. You can imaging what a wider margin it would have been without the other party importing voters and brutalising the locals into fearing to turn out to vote. But Sir do something for us in Sesheke. We are starving here.Last time we voted for the late MP and nothing changed. You saw for yourself how we are suffering from hunger. We are surviving on mangoes here. Please Sir do something as we cannot wait until 2021. We will be dead by then and you will have very few voters from Sesheke. You can even use your own money or send us some meat from your farm Sir. We beg you. Kikikiki but Ba PF you lost, I looked at numbers, wow wow so embarrassing. imagine how many heavy weights PF had pumped in Barotseland. If you divide money spent divided by number of votes, it’s about $50,000 per vote for PF. That’s economically loss. Heeeesh! Unless bena Ba wina then the elections were free and fair ngabanabo Ati the elections were stolen, we’re going to the international community and report you PF, we will go to court, we will call trump. You must be too childish to think that it’s impossible to rig an election otherwise,the phrase election rigging would not be there. 2916 elections were rigged by PF by discarding HH s votes and changing the numbers live. Evidence is there to show that Chulu was changing numbers to make sure HH does not win. HH is an educated thug. He along with Valentine Chitalu and Muna Hantuba have been associating with Boers to rip of Zambia. Government shall send Transfer Pricing Wing staff to audit Izwe, Africa Life and Sanlam Life through which they are externalising millions every year. HH is using money he has been transferring by evading taxes to fund his campaigns. Why ZRA is not moving in to do transfer pricing audit at Sanlam Life Insurance which has been every year externalising millions through transfer pricing mechanism? For a change hakawina hakaivotela!! He lost all seven ward elections on offer. His childishness aside, it’s good to have a balanced parliament instead of having an indirect one party state. Jonny I don’t need a job, I offer jobs. By the way watch out. .all foreigners are now target for deportation. Zambia needs young blood to join politics and shunt out the elitist types of HH, Milupi, GBM, and roughians of all shades in PF, UPND, NDC. Pf youths are stepping stones for the old guards. The likes if Antonio, Sunday , Tayali. Crumb eaters that’s what they are and they seem to be content with the status quo. Lungu is a complete thug and tarven crooked lawyer…even Satas panga violence has been eclipsed by the current politiical violence under lungu…. What kind of a lawyer is lungu who can’t hold a press conference and answer questions ???? @Spaka, awe torn down naiwe. That kind of stuff is for slave traders at PF Secretariat. Nostra…….what kind of a president is this who can not face the press ??? Or answer questions regarding concerns of citizens ?? What about HH’s hired guns? What kind of message he is sending by sitting on UPND top position with his financial muscles and no room for anybody else to replace him and lead UPND to decent political outfit? Kekekeke, awe Choma Eagles are playing good. Garry Nkondo was not drumming for nothing. People that died from lightening are Zambia bs but he has no feelings as long as he wins. This election must be nullified to send a clear message. @Its political, what is your reasoning? If any one had the witchcraft powers that you allude to HH, don’t you think they would gotten rid of their opponents a long time ago? Unless PF have the greater powers (read witchcraft) and nothing can beat them. Logic does not take much or does it? Yes and elections are rigged when he loses but are free and fair when he wins. @ hungry Sesheke, my friend direct that request to HIE. ECL, he is still your president whether you vote for opposition MP or not, hence no need to starve. Comment: The people of sesheke have spoken through the ballot. UPND has convicingly won. PF should not be taking people for granted. Lossing elections is the best way of telling them to change course. People are suffering and yet they are busy stealing. Worse no corrective measures are being taken to stop corruption. The president is even protecting corrupt ministers insteady of dropping them. Come 2021, the electorate should speak louder through the ballot like the people of sesheke have done. Not through bees and lightening? Apparently, I do not hear cries of rigging in this election, what is different? VJ has always said it’s not possible to rig an election. Has upnd won or just retained their seat after throwing in violence and witchcraft???? Are you aware that Pf has won all the seven local government bye elections held yesterday? This includes one seat that was previously upnd? Please be analytical before you expose your ignorance…! Are you aware that Pf has scored more votes in sesheke now than the past elections? Pf got 2000 votes in 2016 and now 3000 plus…! Pf is penetrating upnd strong holds. Instead of jumping up and down for retaining what belonged to you in your strong hold, you ask yourselves why you have failed to win local government bye elections elsewhere??? Zambia is big. Don’t cry foul when you lose again in 2021…!!! You read my mind too. Am surprised that the perpetual loser is celebrating what was obvious where the electorates dont understand the meaning of development because all their lives have been in the woods and its their stronghold based on tribal understanding. Today, this shameless and directionless old fashioned chap hasnt called ECZ as corrupt and pro-PF simply because his stooge has been elected, what a hypocrite! Let the International community now question this Under 5 and lets see what he says. Thank you Kamuti, i think they have heard, but you just retaining your seat, there’s nothing to celebrate, PF can can celebrate since they have won all the local government bye elections. And don’t count 2021 that you will win. We know you will be admitted at the Concourt after 2021 general elections. This seat the UPND had to return, they were losing way too many in their strong holds. Congratulations to the youngman for becoming a Zambian MP. Unlike his party president, he actually is an elected official by Zambian people. Nothing to celebrate about here unless if UPND won this seat in Lusaka or CB urban,Luapula,Northern,Muchinga or Eastern.This was a UPND seat.Let HH celebrate or say such words after winning the Bahati seat in Mansa which is in Luapula where HH’s UPND has never won since 2006!! !SO GO AND MAKE HISTORY BWANA KAINDE IN BAHATI!!! Moreover,see how unhonest politicians can be,HH has not said any word about all the 7 seats at ward level which PF won yesterday including in Kafue and Chavuma……THIS IS HOW HH DECEIVE HIMSELF AND ALL HIS BLIND/TRIBAL FOLLOWERS!! !Uzamudzi Yesu soon bwana HH in Bahati by elections soon as your UPND simply cant win in Luapula!!! I strongly believe HH has a mental problem, our medical doctors should help him. Funny how worked up the PF rats are on LT , makes you wounder is it the beatings their thugs suffered of the upnd win that is choking them ??? Don’t CHEAT yourself ba UPND , HH can NOT WIN or Out smart ECL in PF traditionally place. Learn from lundazi where HH went and camp for days.His candidate has lost to the lowest.PF has grabbed local government seat in c/belt where claimed to be popular.Furthermore,HH will never win in PF strongholds. Electorates in NON – UPND strongholds knows HH that he is power hungry.He wants presidency to fulfill his Anglo-American tie.They have given him much funds for his politics and time has come for HH to pay back. HH grow-up, One would have thought you would be mute and not show that you celebrate when you win, but when you loose you become a cry baby. HH please ensure that your constitution and manifesto are easily accessible.